Santiniketan is part of the Tentative list of India in order to qualify for inclusion in the World Heritage List. Shantiniketan is another Indian site which is having problems getting inscribed (Nominated for 2011 but withdrawn). Its credentials as the location where the Bengali poet, artist, philosopher and polymath Rabindranath Tagore put his ideas into action suggested that it might be worth looking at, both in its own right and in pursuance of my Indian T List quest! It is located 160 kms North West of Kolkata and is feasible as a day trip from there. We took the Shantiniketan Express out, leaving Howrah at 10.10 and arriving at 12.25 and returned on the 17.38 arriving back at 20.15. The train goes to Bolpur which is only a 3km rickshaw ride from the site. Tagore (1861 -1941) is a Bengali, and by transference, an Indian, national hero. In 1913 he became the first non “European” to win the Nobel prize for literature (or any Nobel prize). Interestingly. this was for his own English translation of a collection of his poems written in Bengali which is generally considered significantly less good than the original!! He was later knighted but returned this honour in protest over the Amritsar massacre. In the following years he became an internationally acclaimed figure who, whilst traveling the World, met with all the great and good of the era so there are reams of photos of him meeting Einstein, GB Shaw, Helen Keller etc etc. He is credited with bringing Eastern culture to the West and vv . The sorts of epithets applied to him include “Internationalist”, “Idealist”, “Humanist”, “Naturalist” and “Pacifist” – all “good stuff” one would think for UNESCO! His persona was of a saintly (even Christ/"God"-like) figure in flowing robes with a long white beard/hair – the archetypal “Eastern Philosopher” in much the same way as Einstein’s persona was of the archetypal “mad professor”! 2011 was the 150th anniversary of his birth and, even in 2013, in Bengal certainly, there were large public photos of him looking down on everyone. When one adds that he was also the composer of the National Anthems of both India and Bangladesh one can see why India would have tried to gain inscription for a site related to him in 2011. It might also be mentioned that 2013 is the 100th anniversary of his Nobel award – however India is rather more shame-faced over this as the medal was stolen in 2004 from the museum in Shantiniketan and has never been recovered – though the prime suspect was murdered a few years later, presumably for sullying the honour of Bengal/India. a. The Ashram – the original heart of the development, contains the Chhatimtala meditation place (Successful graduates of the University are each presented a branch of five leaves from the Saptaparni trees which grow around it), the Amro Kunja or Mango Grove under which students learn with their guru and the Upasana Griha or Prayer Hall where prayers, a la Tagore, take place weekly. Tagore’s religious beliefs were based on eastern religions but are eclectic, syncretic, mystical, non-denominational, encompass Christianity and are beyond easy categorisation. One of his most famous books consists of a series of lectures titled the “Religion of Man”. This is usually published with a joint conversation with Albert Einstein titled “Note on the Nature of Reality”!! b. The Uttarayan – the complex where Tagore lived and worked. This contains 5 houses in different styles. The Shyamali is in the form of a traditional Bengali mud house and was where Tagore welcomed Gandhi (though the 2 did not see entirely eye to eye on philosophical and political matters!). Unfortunately India’s obsession with controlling photography operates here and no photos are allowed within the complex - even outdoors. c. Kala Bhavan – the college of Fine Arts and Crafts (Photo). Here work is both done and displayed in the open – here and elsewhere works by noteworthy modern Indian sculptors are also on show. d. Sangeet Bhavan – the College of Dance and Music – but we didn’t enter this. 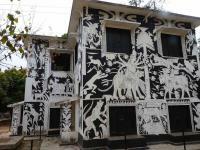 e. Rabindra Bhavan – a memorial and Research centre for Tagore studies. This operates as a museum and something akin to a shrine to Tagore. Shoes have to be removed and quietness observed. A replica of the stolen Nobel Medal is displayed (very well guarded!!!) and a raga is played continuously. Among several other potentially significant locations which we did not visit are the nearby Palli Samgathana Vibhaga, originally established Tagore in 1922 “with the primary objective to bring back life into villages making them self-reliant and self-respectful, acquainted with the cultural tradition of their own country and competent to make an efficient use of modern resources for the improvement of their physical, intellectual and economic conditions.” Tagore’s role in developing ideas for rural development is considered significant but, whether this site is included in the nomination I don’t know. c. An ICOMOS evaluation team (led by a Nepali) visits Shantiniketan in Oct 2010 to significant Indian press coverage with much optimism! g. Nov 2011. Press report states “The officials said the work has been expedited and the resubmission of the nomination will be done by December so that if all goes well, the university will be declared a World Heritage Site in July, 2012 when the UNESCO meets in Paris.”. But no such events occur! Without access to ICOMOS’s detailed comments it is difficult to know if the problems it identified are fundamental or addressable – clearly India thinks they are of the latter category – a bit of reorganization and removal of mistakes and everything will be ok!! But it is unusual for a withdrawal to occur so early so the ICOMOS team must have been pretty “up front” with their views! I remember my visits to the inscribed Universities in Mexico City and Caracas and ask myself if they are of any greater OUV than Shantiniketan. Some (but certainly not all!) of the architecture at the former is more “iconic” whilst that of Caracas is really not that special. Unfortunately many of the University buildings at Shantiniketan are typical low cost Indian 2 story concrete structures not in a very good state of preservation. However, neither Mexico nor Caracas contain an ensemble like the Ashram and Uttarayan nor have the same degree of “philosophical underpinning” and historical significance. I believe therefore that Shantiniketan could be a valid candidate – the quality of the proposal is of course another matter! However, inscribed or not, we enjoyed our day trip out there and value the extra insights it has given us about Tagore.